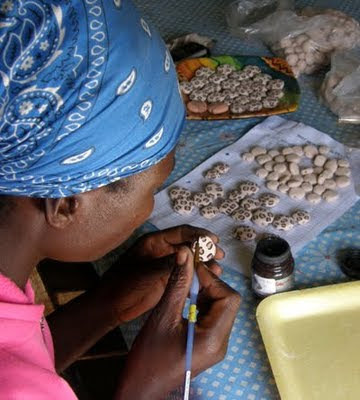 The mission of Work of our Hands is to provide hope and dignity for the unemployed through the creation of cottage industries, which produce handcraft products for local and international markets. We envision a holistic ministry that teaches handcraft, basic life skills, and business skills, as well as addresses the educational and spiritual needs of participants. Skills alone will not overcome the apartheid legacy. The greater challenge is to impart new life skills, and a new way of thinking. We work with people in informal settlements ( squatter's camps) Many have come from the North to find work, but have not found work. Over these camps, there is a cloud of intense poverty, and worse, a poverty mentality. Above all else, there is a sense of hopelessness that life will ever improve. Many families survive somehow on $2 American dollars or less. Children go hungry, and uneducated thus doomed to repeating the cycle of poverty. always begin with small endeavors and people committed to making a difference.